> – The Cincinnati Hockey Blog has a nice feature on the pro career of RedHawks Assistant Coach Chris Bergeron. Happy (belated) birthday Berge! You can check that out at this link. 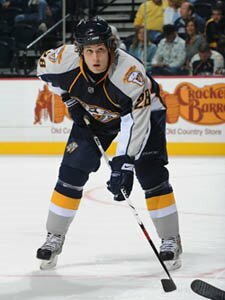 – Ryan Jones scored the game winning goal in OT Friday night as the Milwaukee Admirals defeated the Houston Aeros, 2-1. Jonesy was also named the as the game’s first star. Milwaukee and Houston again, face-off today at 3:50pm. – Nino Musitelli had a knee first collision with the dasher board on Friday night and sat out of Saturday’s game against Reading. No word on whether or not Musitelli will play tonight, as the Dayton Bombers once again host Joe Cooper and the Reading Royals. Nino has been impressive with the Bombers, scoring 6 goals and 9 assists. 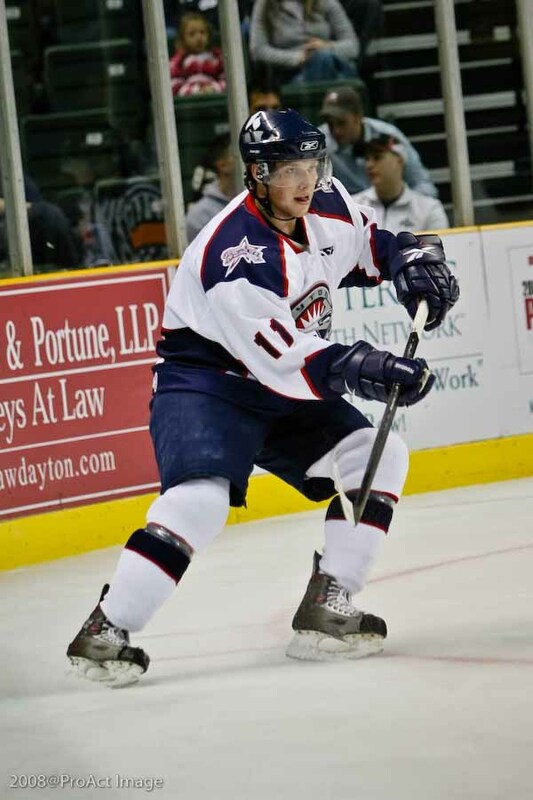 – Mitch Ganzak (Wheeling) is currently second in the league’s plus/minus ranking, with a +15 on the season. Another former RedHawk, Ernie Hartlieb, is fourth, with a +13. Forwards Patric Hornqvist and Ryan Jones will play at least two more games for Milwaukee of the American Hockey League. The two rookies were reassigned last week and were scheduled to play at least three games for the Admirals. They finished their third game on Wednesday, with Hornqvist posting four points and Jones two during that stretch. The Admirals will visit Houston on Friday and play host to the Aeros on Sunday. Nashville Predators President of Hockey Operations/General Manager David Poile announced today that the club has reassigned rookie forwards Patric Hornqvist and Ryan Jones to Milwaukee of the American Hockey League. Both players will join the team in Iowa for the Admirals games against the Chops this weekend. Jones has also skated in 15 of the team’s first 18 games, posting three goals and six points with four penalty minutes and 23 shots on goal. Acquired in a trade from the Minnesota Wild this summer, the 24-year old is playing in his first full professional season after four years in the NCAA ranks with Miami of Ohio. With the addition of Jones and Hornqvist, the Admirals have reassigned forward Ian McKenzie to the Cincinnati Cyclones of the ECHL. McKenzie has skated in nine games for Milwaukee this season and recorded two penalty minutes. Ryan Jones – 15 games played, 3 goals, 3 assists, 6 points, 0 on the +/- ratio, and 2 power play goals. This Preds rookie has been able to produce when put on the 2nd line, but finds himself on the 3rd and 4th lines recently. Dr. Felder has discussed before why this won’t work for Jones style of play. Ryan has done well so far this season, he plays in the dirty areas, is willing to take punishment, does well at the garbage goals, draws penalties, and has had a good start to his rookie campaign. Dr. Felder says Jones should keep doing what he is doing, but take a “More TOI and Better Line” pill if possible. Taylor Hustead, chosen as the Southern Professional Hockey League’s 2007-08 Rookie of the Year was formerly recognized for his accomplishment last Thursday night by SPHL Commissioner Jim Combs. The presentation by Combs came during an on ice ceremony prior to the start of the Twin City Cyclones’ game with the Columbus Cottonmouths. Hustead, age 24, of Scottsdale, AZ scored 25 goals and had 21 assists in 47 games with the Cyclones during the 2007-08 season, his first year in pro hockey. Hustead, played junior hockey in both the North American Hockey League and the United States Hockey League and his collegiate hockey with Miami University (Ohio) before turning professional. He spent most of the 2007-08 season with the Cyclones after a short stint with Muskegon of the International Hockey League. He returned to the Cyclones Thursday night after playing six games in the Central Hockey League with Memphis. He scored a goal in his season debut in the loss against Columbus. General Manager Sean Cowan also congratulated Hustead. “Cyclones fans and management congratulate Taylor on this recognition. Taylor obviously had an excellent year for us last season and with his return we are excited about his potential contributions this year. The Twin City Cyclones are members of the SPHL, the leader in Single “A” Hockey. 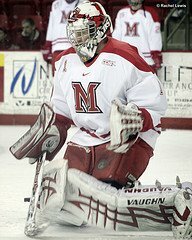 Connor Knapp picked up the second rookie of the week award of the season for Miami University and his first conference weekly award of his career. Knapp earned the award with his Perani Cup first-star performance against then-No.17 Michigan State on Nov. 15 at Munn Ice Arena. Knapp posted 23 saves and only allowed one goal en route to his fourth win of the season, all against CCHA foes. The freshman lowered his goals against average for the fourth consecutive game and has only allowed three goals in his last four games. Corey Tropp scored at 11:49 of the third period and ended Knapp’s streak of three consecutive periods of shutout hockey. Knapp went 85:26 without allowing a goal. His biggest save of the night came in the second period when Tropp looked like he had a great opportunity to even the score at one, but Knapp made a solid kick save and preserved the lead for Miami. The RedHawks are not just a one man operation in the net. Fellow freshman goalie Cody Reichard is also one of the conferences’ top goalies. Both Knapp and Reichard hold goals-against averages below two, and both have save percentages above 92-percent. Together they have helped Miami to a 1.88 goals against average on the season. The two have played so evenly that they are tied for 12th in the Perani Cup standings. Both have a first star and a second star to their credit. On the campaign Miami has split time evenly between the two net minders as Reichard has handled all the Friday starts and Knapp all the games on Saturday. >The following post is brought to you by Jeff Blashill and the Indiana Ice. For all of your recruiting needs, visit Jeff and the friendly folks over on E. 38th Street, in Indianapolis. Yes, Miami has landed another commitment from Indiana of the USHL; his name…Shane Berschbach. A native of Clawson, Michigan, Berschbach stands 5’8 and weighs in at 135 pounds (Nathan Gerbe would be proud). This makes the third player from Indiana to commit to Miami. Max Cook and Joe Hartman will be heading to Oxford in 2009. No word on when Shane will be joining the RedHawks. >The CCHA has a neat feature “getting to know” Coach Blasi, on the league’s official web page.